UltraEdit 2.3 for Mac is now available. You can get the download here. The change log is here. Previous releases have coincided with the Linux release. Let’s hope 2.3 for Linux will come soon! Do not consider driving yourself. The traffic is crazy! I’ve never seen anything like it before. I experienced several “we’re all going to die” moments in every trip I took. Probably the worst was when two lorries moved together with our minibus between them. If our driver had not sped up in time, I’m quite convinced the ACE program would have lost several members. As you may have already read, some of the ACEs were in a crash, but came out of it unharmed. I was only able to wear a seat belt on one journey because all but one of the vehicles either had no belts, or belts but nowhere to plug them in. This takes a lot of getting used to. If you have any sort of respiratory issues, it’s probably best to avoid Beijing completely. The pollution is very bad. It quickly makes you feel like you’ve smoked 40 cigarettes for breakfast. Even at the Great Wall (50+km from the city) it is still really bad. Make sure you have printed copies of the Chinese names for any locations you want to visit. Having an English address is pretty much useless. Even with the Chinese addresses, it was often very difficult, especially if the print was small. Don’t rely on any cloud services for your journey. You need local copies of everything and any apps you want to work with should have full offline functionality. Why? The Great Firewall of China is very effective at blocking a variety of services. Most Google services were trashed. Gmail was intermittently offline and I was never able to access attachments. Google Docs essentially doesn’t exist. Google Reader would work for about 5 minutes at a time, then fail bigtime. Most annoyingly, I was unable to use Google to search for anything. 🙁 I was able to search with Bing, but I could only see results in Chinese. Even when I switched to English, I still got results in Chinese. Like I said, be very well prepared because searching for information is not easy. I’m sure there are ways to cope if you are clued up, but I was a little naive and went with very little preparation as far as logistics were concerned. Take money with you. I was able to get cash advances from my credit cards, but the ATM failed to get cash from any of my bank accounts. In a few days I will transplant to Auckland and start the NZOUG conference. My flights to China were rather uneventful. The Birmingham to Dubai leg was delayed by an hour due to fog in Dubai. I had a 4 hour connection in Dubai originally, so the delay was no big deal. Arriving in Beijing was a little unnerving. I misplaced the Chinese version of the hotel address, but had the English version. Finding someone to translate it proved very difficult and as it turned out they translated it incorrectly. Fortunately I found a cached version of the address on my iPad, so that saved by bacon. The second hitch was that I couldn’t get cash with by debit cards. Just a flat-out refusal from any ATM in China. Arrrggghhh! Fortunately, I was able to get cash advances using my credit card. I’m going to pay through the nose for it, but at least I can survive. Today is the first day of the conference and I had a morning slot. For the English speakers, we had one screen showing our slides in English and one showing the Chinese translation. I was asked to speak more slowly than usual (kinda difficult for me) and as a result I had to reduce the content somewhat. I did a run through last night to make sure my timing was OK with this adjustment. The conference has a single track, so you get a room full of people from different technical areas. This is always a little unnerving as you worry about the relevance of your material to audience. Here are a couple of photos of the audience I took while I was setting up. With a bit of luck I will get to see some of Beijing over the next couple of days. I’m behing the Great Firewall of China, so some sites (Facebook and Twitter) are blocked completely and many other sites (like Gmail and any other Google related services) seem to come and go. For the time being my blog seems active. If I lose access to it I will update things once I get to New Zealand. It’s my mom’s 70th birthday today. Happy birthday Val. If you remove the humans from Real Steel, you pretty much have Rocky. As far as the humans are concerned, Hugh Jackman is ok. The kid who plays his son is a little annoying, but to be fair, so are most of the kids in films. There are quite a few cheesy moments, but they are spread out so they aren’t like fingernails down a chalkboard. Having said that, its an OK bit of mindless fun. I tried to listen to other people talking on the way out to gauge the general reaction. It seemed to vary from “Awesome!” to “What a complete pile of xxxx!”. I guess I stand somewhere in the middle. I was chatting with the lady doing OCP Lounge registrations at OOW11. 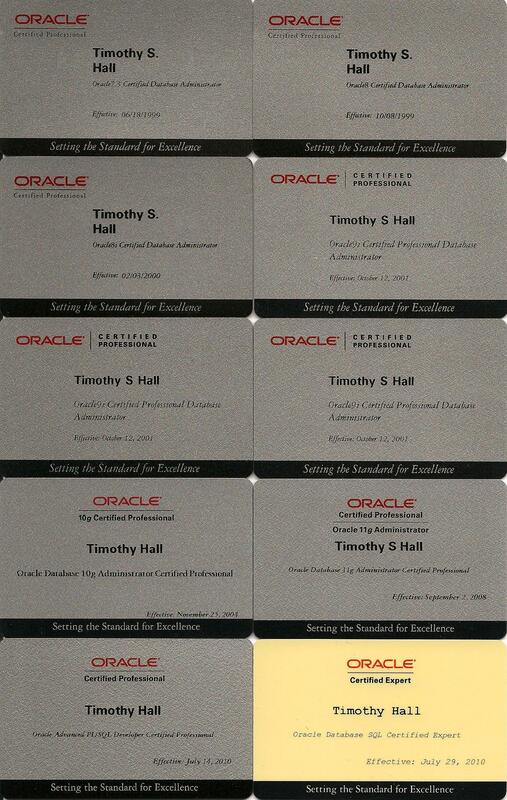 During this chat I mentioned I hadn’t received a certificate for the SQL Expert certification. It never crossed my mind to re-request it, since my certifications are visible on certview.oracle.com anyway. Yesterday, a DHL man delivered the missing certificate, which prompted me to look though my certifications and scan this image. First, check out the card on the bottom right. I was unaware the “Expert” certifications had a different colour card. Second, notice anything funny about the 9i DBA OCP certification? Anyone who knows me knows I’m obsessed with flexibility. I love stretching and I love watching anything involving flexibility. San Francisco has a famous Circus School, so previous OTN parties have had assorted circus performers to entertain the punters. In addition to the usual clowns, this year there was a contortionist with a hula hoop. She did elements of the Cirque du Soleil act made famous by Elena Lev in Alegria. You can see the original act here. Needless to say I watched the contortionist at the OTN Night while stuffing noodles into my face. I’ve just put iOS 5 on my iPad, who wants to touch me? It took about 30 minutes in total, but I’ve heard some on Twitter saying it took them 3 hours. The update does a full backup and restore, so I guess the more stuff you have on your iPad or iPhone, the longer it takes. I mentioned the day before Open World I put a Virtual RAC on Oracle Linux 6.1 article live. Although the procedure was complete, some of the screen shots were from an old article as I didn’t have time to redo them before my flight. 🙂 I’ve just run through the procedure again and taken new screen shots. As a result, I’ve allowed the article to display on the front page of the website, which is why you will see it listed as a new article there. 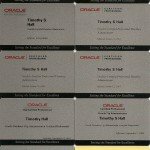 This kinda rounds out the whole Oracle on 6.1 stuff as there has been a single instance installation guide out for ages and more recently the Cloud Control installation, which references it. Remember, it’s still not certified yet, but it’s coming. Update: It’s finally certified. See here. If anyone was wondering why football (soccer) in the UK is gradually being eroded to the point where we are a 3rd world country, you might want to take a look at this. So in schools the kids are streamed based on their ability, with the most able kids paraded as shining examples of academic excellence and that is considered fine, but put them on a football field and the physically excellent kids have to be held back to allow for the weak to “compete”. This makes me sick. This has nothing to do with the kids. They don’t even read the papers. It’s to do with politically correct parents who just can’t deal with the fact their kids are wet lettuces. You can be sure the kids will remember a 20:0 defeat and you can be sure their friends will know the real score. The real problem with the Telford Junior League is they have a “football for all” policy, which is good, but they refuse to stream the kids at an early age, so teams made up of Premiership Development Center players are playing against kids who are rarely facing in the direction of the ball. That’s no joke. I’ve seen it. With this in mind, of course some teams are going to get the sh*t kicked out of them. Every kid should have the right to play football, but it should be against opposition that is of an appropriate level to them. Stream the kids in sports, the way they are in school. This latest nonsense from the TJL is political correctness gone mad. Life isn’t fair. Everyone is not equally good at everything. Kids need to learn that and start working hard for the things they want, rather than having it handed to them on a plate. Update: The decision has been reversed. The full scores are now being published again. I like to think my blog rant helped, but the reality is, just about everyone with any sense could see that lying about the scores was not sensible.